The real question about this year’s Labour Party conference is what on earth everyone will talk about for four days. The supposed Brexit barney will be a damp squib and leadership rows have disappeared. So here’s a suggestion to fill the awkward silences: it’s time Labour talked about the arrival of generational divides in our politics – and how it’s partially supplanting the traditionally dominant role of class. We’re not talking here about the non-existent ‘youthquake’ of 2017 but rather a huge gradual shift in the tectonic plates of who votes Labour. This poses questions of policy, political strategy and identity for the party. And it matters more for its future than all the talk of selections, reselections, and deselections combined. 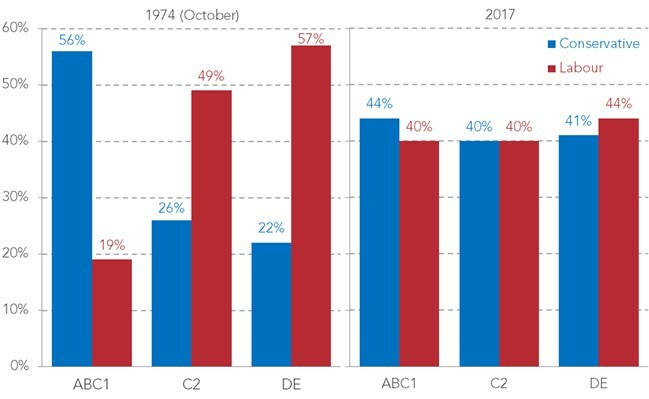 To understand these generational divides let’s start with some history and compare the voting patterns of the June 2017 election with that of the October 1974 election – the last time both Labour and Conservatives commanded in the region of a 40 per cent vote share without either winning a landslide. New Resolution Foundation analysis from a forthcoming book, Brexit and the British Model, shows that back in 1974, 40 per cent of voters supported Labour in almost every age group. Age was a political irrelevance. But by 2017 it had become a key driver of whether someone votes Labour – a 30 year old was almost twice as likely to vote Labour as a 70 year old. 70 year olds were also twice as likely to vote Tory in 2017 as 30 year olds. Crucially these stark age divisions in partisan preferences were not new in 2017. 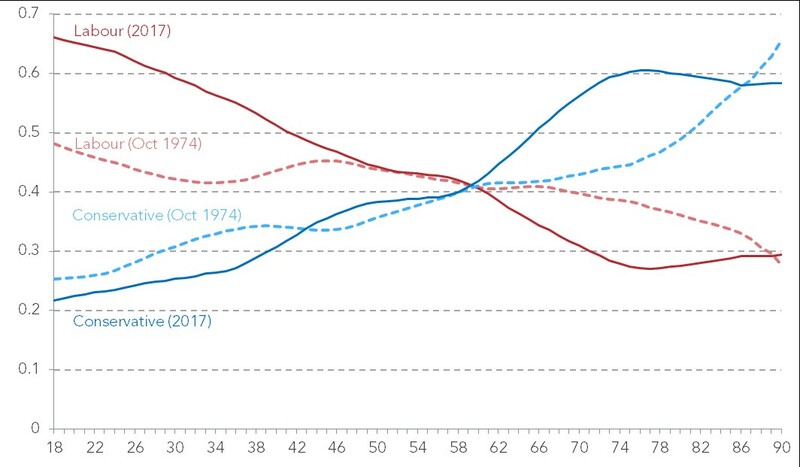 The age divide started emerging in the 1990s in the case of the Conservative Party and post-2001 for Labour. On this, if not much else, Jeremy Corbyn has doubled down on Tony Blair’s legacy. So if age divides are now taking centre stage in British politics, what have they replaced? The answer is class. Of course class still matters hugely but in the 70s working class voters were three times as likely to vote Labour as Conservative. Today they are as likely to vote Tory as Labour, the party founded to represent working people. This comes despite Labour clearly aiming to have an agenda that takes the side of workers over capital, from stronger employment rights to greater employee ownership. Once the conversation on these huge shifts has started, there are two big mistakes to be avoided. First, the mistake of arguing that Labour should be happy with the status quo. The argument goes that yes, the Conservatives have the support of those most likely to vote, some say, but Labour has the voters of today and tomorrow. However, these age divides are a big part of why no party has got near forming a government with a significant majority since 2005. And a radical programme is nothing without the votes in Parliament to make it happen. Labour strategists should also be careful about concluding that having the votes of the young means the tide of history is helpful – people change their behaviour as they age, and Britain itself is ageing. The second mistake is superficial gesture politics attempting to reach across the generational divide. Here Labour could learn a lesson from their opponents about how not to do it. The Tories gave the young £9,000 tuition fees and £14 billion of welfare cuts, then attempted to win them back with a discount rail card. It’s safe to say it hasn’t done the trick. But while Labour MPs laugh at the millennial rail card, they should ask themselves if their approach to winning over older voters is really that different. Rather than thinking how Labour need to change, they have committed to keeping free bus passes and are waiting for the gratitude to flood in. If Labour wants to heal these divides, it needs to dig into their causes – our politics often changes because our country has. Economic divides between generations have opened up – not least as wealth surges among the old and stagnates among the young. But so too have cultural divides that have left some older voters feeling like they didn’t leave the Labour Party, it left them. Both need to be addressed if a cross generational coalition is to be built. On economics, transactional gesture politics towards older voters risks Labour ignoring the huge shift in incomes and wealth in their favour. The party’s lack of appetite for reform of wealth taxation points in that direction. Such an approach will hamper attempts to maintain our welfare state in the face of an ageing society without hammering the living standards of younger generations. Yes, some older voters are put off by what they perceive as the economic risk of a labour government, but most are voting Conservative not because Labour’s economic policy is too left wing but because culturally it feels too other. As Paul Mason has argued, Labour is comfortable talking about food banks or rough sleeping – but far less comfortable on issues of security, policing and crime. Or Russia. The party looks and sounds like its core vote – those that live in our big cities or young university towns. This is as much about older places as older people – a festival of politics in north London might help pile on the votes in Tottenham, but doesn’t feel as relevant in Cleethorpes (where the Tory majority has increased in each election since 2010). Fundamentally it is about recognising that our politics has changed. As Marx and Engels’ Communist Manifesto didn’t quite say, “Society as a whole is more and more splitting up into two great hostile camps, into two great classes directly facing each other – Bourgeoisie and Proletariat young and old” – it’s time Labour talked about it. CB40: Happy 40th birthday to child benefit! But will it last another twenty?